The BAI's compliance and policy manager Declan McLoughlin and CEO Michael O'Keefe. 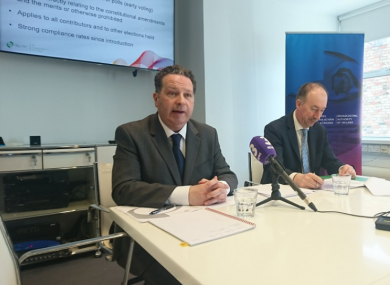 THE BROADCASTING AUTHORITY of Ireland (BAI) has released an update of its referenda guidelines ahead of the proposed Eighth Amendment referendum. The guidelines are there to “assist broadcasters in decision-making” as they have an “important role in influencing” the information that citizens get ahead of referenda. The guidelines are for radio and television broadcasters in the Republic of Ireland, but don’t apply to social media (eg Facebook Lives, tweets, etc). The BAI said that international media organisations such as Sky News have “had regard” to the media guidelines in the past, despite being under no legal obligation to do so. The updated guidelines refer to how social media, opinion polls and advertising (among other features) should be treated by broadcasters such as RTÉ, TV3 and Newstalk. BAI CEO Michael O’Keefe said that the biggest challenge for broadcasters with regards to the Eighth Amendment referendum was that this is a “controversial Amendment” with “strong views on either side” which might lead to “adversarial” rather than informative debates. The BAI also added that the biggest number of complaints received during referenda have been in relation to presenters giving an opinion prior to referenda being called. O’Keefe said that it’s their view that if a presenter is “actively engaged” in one side of the campaign they “shouldn’t be on air”. Although the BAI has general rules that state “every broadcaster shall ensure that all news broadcast by the broadcaster is reported and presented in an objective and impartial manner and without any expression of the broadcaster’s own views”, this update has been made with specific regards to upcoming referenda. Here’s a look at some of the rules which have been clarified by the broadcast authority ahead of the Eighth Amendment referendum. “Fairness, objectivity and impartiality can be achieved during programming by including referenda interests from both sides of the debate. It may also be achieved effectively by the input from the programme presenter playing the role of ‘devil’s advocate’. It may be further achieved via inputs from other contributors who may not be campaigning for a particular outcome in a referendum/referenda but who may articulate the views of one or other side of the campaign in the course of a programme discussion or a debate drawing on their expertise or experience. As such, there is no obligation to automatically ‘balance’ each contribution on an individual programme with an opposing contribution and fairness may be achieved in a range of ways. The BAI said that where opinion polls related to the topic of the referendum are referenced, the “significance” of the poll should be explained to the audience. Information on the details of the date of the poll, by whom it was commissioned and/or paid for, the company/organisation who conducted it, the number of people polled and their location must be provided on air. “In addition, while it is legitimate to have due regard to the weight of public opinion as indicated by poll results, broadcasters should also be mindful of the fact that while public opinion may favour a particular position, this does not make the opposing position less legitimate simply on the basis that a majority view persists. In this regard, broadcasters should also have due regard to the merits of any arguments set out by those that favour or oppose referenda proposals that citizens are being asked to consider. Although the BAI said that its statutorial powers don’t stretch to how social media is used, it said that broadcasters should have “policies and procedures for handling on-air contributions via social media”. These policies and practices must be applied where social media is referenced on-air in the context of referenda coverage. With regards to adverts, the standard guidelines in place state that “a broadcaster shall not broadcast an advertisement which is directed towards a ‘political end’”. It said that it considers the content, context and aims and objectives of the advertiser when deciding of an advert complies with their advertorial rules. In this context, broadcasters shall ensure that advertising is free of material that could be interpreted as content that addresses referenda issues or which might be reasonably considered as being directed towards a ‘political end’. As part of their role to “foster a media landscape that is representative of… the diversity of Irish society”, the BAI wants broadcasters to include a wide variety of voices during the referendum debate. Radio and television broadcasters shall observe a moratorium on coverage of referenda. The moratorium shall operate from 2pm on the day before the poll takes place and throughout the day of the poll itself until polling stations close. The moratorium doesn’t apply to social media. The complaints procedure is handled in the same way as normal BAI complaints, which includes not accepting complaints prior to a broadcast. The guidelines will come into effect 6-8 weeks ahead of the referendum, the BAI said. You can read the updated guidelines on the BAI’s website here. Email “Broadcast guidelines updated ahead of the Eighth Amendment referendum”. Feedback on “Broadcast guidelines updated ahead of the Eighth Amendment referendum”.